We are pleased to accept students from all over the world. Because our training is delivered very effectively via distance learning, you can enroll in this course from anywhere in the world, and study from the comfort of your home. We offer the option of Floral Design Classes online in addition to shipping our course training materials directly to your door. Since 1999, our courses have been used very successfully, and with an exceptional satisfaction rate, by students all over the world. We take our international audience into account when developing our courses in order to ensure relevancy. We have many students in the UK, Australia, Asia, South America, Europe, the Caribbean, as well as countless other locations around the world. We love our international students, and we are happy to work with you. All that is required is the ability to write in English – but not to worry, it doesn’t have to be perfect English! We are very easy to get along with, and our #1 desire is to help you to learn – our instructors are very patient and adaptable with students for whom English is a second language. As long as you can understand us, and we can understand you, we can work together! After you register for the course, your training materials will be promptly shipped and delivered to you, anywhere in the world. As you study, we are always just an email away if you have any questions, need any advice, or require any support. Its as easy as that! Working with weddings is fun, glamorous, exciting, and always interesting! 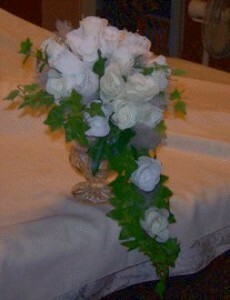 Weddings are a romantic and prestigious area of floral design. Every bride is different, every wedding is unique, so you’ll enjoy new experiences all the time – you’ll never be bored by your work, and you’ll always be surrounded by happy people. Its deeply rewarding to play a role in the happiest and most important day of people’s lives – their excitement is contagious and inevitably rubs off on you. The personal satisfaction you experience when working with couples in planning the day they have been dreaming of for their entire lives is personally rewarding. And if you are looking to start your own floral design business, specializing in weddings is a smart strategy. Weddings are a huge and lucrative $50+ billion a year industry. By tailoring your services to the bridal market, you’re creating a competitive niche for yourself, in which there is no shortage of eager consumers. As mentioned earlier, if you are interested in starting a business in this field, our Wedding Floral Business Training Manual is packed with precisely what you need to know to get yourself established quickly, effectively, and successfully, with very little expense. This manual is an absolute must for anyone who is considering starting a wedding floral business, or who has already done so but wants to quickly improve it. Its been used by people all over the world with a very high satisfaction rate. If in addition to your interest in floral design, you also have a passion for weddings, becoming a wedding floral designer is an obvious move. This course was written for you. Weddings provide a very positive environment in which to work, filled with people who are bubbling over with excitement, happiness, and enthusiasm. The lives of your clients are are filled with promise and giddy anticipation. How many fields enable you to work everyday with people who at the happiest point in their lives? And to surround yourself with beautiful things in the process? Can you think of a better way to earn a living? How many people have the opportunity to earn their income doing what they love, perhaps even from the comfort and convenience of home? Working from home is a very viable option for the wedding floral designer, and in fact, we encourage you to seriously consider it for the many advantage it offers. Low overheard and minimal operational expenses, zero commuting time, the ability to be home with young children if applicable, the ability to involve other members of the household in a ‘family business’, the ability to more efficiently manage one’s time. And then there is the comfort factor – put simply, it’s incredibly comfortable to work from home. Today, with the growing popularity of telecommuting, its becoming increasingly common for people to earn their living right from home, so there is no need to be concerned that you will be taken less seriously as a home based wedding floral designer. In fact, the home based operation is very suitable for wedding floral designers because of the intimate, comfortable and more personal environment it provides for the bride to meet with you. Of course, you may have your sights set on opening a floral shop, or getting a job with one, once you have completed your wedding floral training. These, of course, are equally desirable options. It all comes down to each individual’s personal preference, and to whatever will suit your lifestyle best. The important thing to note is that your options will be open, and you will be free to proceed in the manner which works best for you. Through this course, even if you have no previous professional floral design experience, you will discover the professional principals, methods and techniques for designing bouquets, corsages, boutonnieres, flower baskets, pew markers, table arrangements, alter arrangements, and centerpieces for weddings: you will discover how to use the language of flowers, personal meaning, color, traditional wedding floral design guidelines, body proportion, style of attire, style of wedding, spacial requirements and much more in order to offer professional expertise and skill in consulting with your clients and designing the flowers for their weddings. All of this information is presented in an easy to follow, fully comprehensive training manual consisting of over 425 pages packed with information. 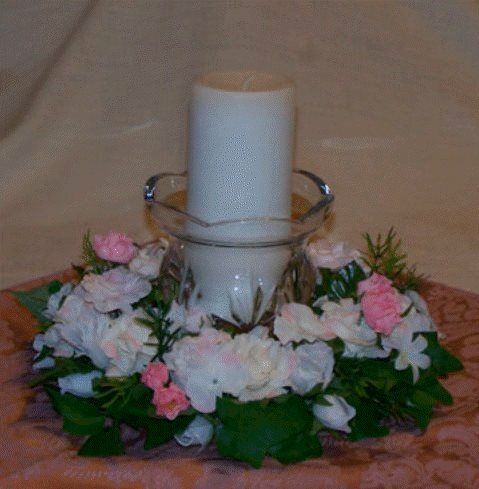 We also offer the full manual through Floral Design Classes Online if that is your preference. Our course training manual doesn’t waste valuable page space with filler material, reviews and overviews of subjects previously discussed, or blank spots for writing your own “notes” – no student should have to pay hard earned money for that. We pack our pages with information to transfer a wealth of knowledge to you. Additionally, this course won’t waste your time, effort, or money by requiring you to learn about areas of floristry which have no applicability to wedding floral design, which are therefore of no interest to you, which don’t inspire you, and which you will never use. 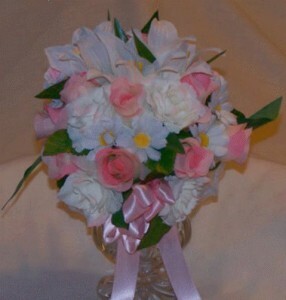 If what you want is to become a Wedding Floral Designer, you probably don’t have the interest, desire, or need to learn how to make casket sprays for funerals, get-well bouquets for hospitals, or countless other lessons which have absolutely nothing to do with Wedding Floral Design. What you need is specialized, concentrated, in-depth information which is directly targeted to your area of interest. You’ve come to the right place for that. We are leaders in wedding-industry related training. Weddings are our business, and have been for many years. We’ve been offering our courses for nearly two decades to students all around the world, and long before that we operated our own successfully wedding businesses. We know what its like to effectively train students, and we know what its like to work face to face with the bride. To really gain the specialized wedding related training you want, you need to look to a leader in the provision of wedding-related training — an organization which specializes in providing the precise type of knowledge you are looking to gain. This is what you will find in The International Institute of Weddings. By trimming away all of the topics and lessons which simply aren’t relevant to your interest in wedding floral design, we are able to delve in much greater depth into what is going to be of use and interest to you in becoming a wedding floral designer. Rather than teaching you a lot about what you’ll never need as a wedding floral designer, and not enough about what you do need to truly specialize in weddings, we’ll focus completely and intensively on wedding floral design. We won’t waste your time, money, and effort on lessons that lack relevance to wedding floral design, and which you lack interest in. Instead we’ll focus on what you are truly inspired by. Many people dream of being able to earn an income while doing something they truly love, perhaps even in a business of their own, but they never acquire the skills or abilities to make that dream a reality. Many also dream of being involved in the glamorous, exciting and prestigious wedding industry on a daily basis, but don’t know where to start to make that happen. You, however, now have the opportunity to pursue your dream. Isn’t it time? There’s a saying we like to use around here: “It’s never too late to be who you want to be”. Taking the steps necessary to make it happen is really so easy and enjoyable through the specialized knowledge this course will provide. A whole new world awaits you – one which enables you to continually surround yourself with beautiful things and happy people while earning an income in the process, if you choose. For anyone who has ever gone to work in the morning and thought, “There must be more to life than this….” , this course will give you the skills, knowledge, and ability to finally start doing something you love. Come learn with us! You’ve got creativity, and we want to help you unleash it. You’ve got a dream, and we can help you reach it. 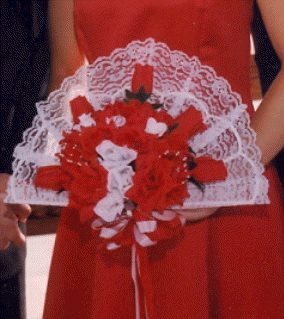 At a one time cost of only $495, anyone who has the desire to learn the methods, techniques, processes, approaches, and professional secrets of wedding floral design now has the ability to realize that dream. Colleges and technical vocational schools charge triple or more for this level of specialized instruction and information, when its even offered at all. At this low price, there are no more reasons not to go after your dream. Get started today! Enroll now and you training materials will be in your hands just as fast as we can ship them to you! All photos featured in the course description are of actual design work done by students of this course, based on the techniques, methods, and lessons they have learned in the course material. Enroll today and you’ll soon be designing gorgeous flowers for weddings using professional floristry techniques and methods revealed in the program.